We had a great event in Temple TX recently. Thanks to our host and attendees! Fill out the form to stay informed about our upcoming events in Texas! Education Elements and Google for Education Texas are hosts for the National Academies for Personalized Learning. Most recently this event was held in Temple, Texas in partnership with Temple ISD. For the last several years, Temple ISD has been focused on how to best transform and enhance instruction, how to improve relationships, and how to help all learners take more ownership of their learning. Part of this effort has included the successful shift towards blended instruction. G Suite for Education and Chromebooks are the backbone of creating a personalized learning environment for schools. Google's Admin solution for schools allows for a safe, secure environment for students and teachers to share, work and learn together. The G Suite apps provide the power of anywhere, anytime learning that makes our Blended Learning initiative in Temple ISD possible. Ed Elements is an education consultancy that works with districts to build and support dynamic school systems that meet the needs of every learner, today and tomorrow. Ed Elements has provided Temple ISD the framework and guidance to empower administration and staff to reimagine learning in the public school setting. The training provided in goal setting, project planning, and implementation of Blended Learning is enabling TISD to harness its own creativity and knowledge to develop a district plan that, as the vision says, "Will transform the academic experience by creating an environment that fosters ownership, innovation, and reflection". 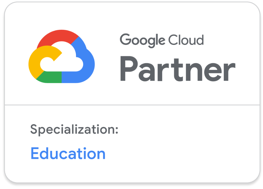 Education Elements is incredibly excited and honored to be one of the first two organizations that are part of Google’s newly created Transformation Partner program.